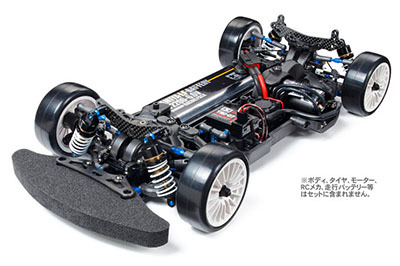 This R/C model assembly kit features the efficient shaft-driven 4WD TB-04 chassis loaded with high performance parts. Main resin parts have been replaced with carbon fiber reinforced resin equivalents for improved rigidity. Aluminum suspension mounts plus TRF418 design suspension arms and uprights are married with TRF big bore dampers for consistently superior grip, while an aluminum steering bridge and linkage give highly direct response. The chassis utilizes a front direct-drive and rear gear differential unit setup, with aluminum propeller shaft, pilot shafts and transmission shaft further slashing power wastage. With around 30 different option parts specially selected by TRF themselves, the TB-04R is a race-happy chassis that you'll just love to drive!